This past weekend we hosted the second portion of our Valentine's potluck and kicked up our heels in celebration of Marshmallow Day, also known as White Day. Not being one to sleep in on the weekends, I woke up bright and early to prep. 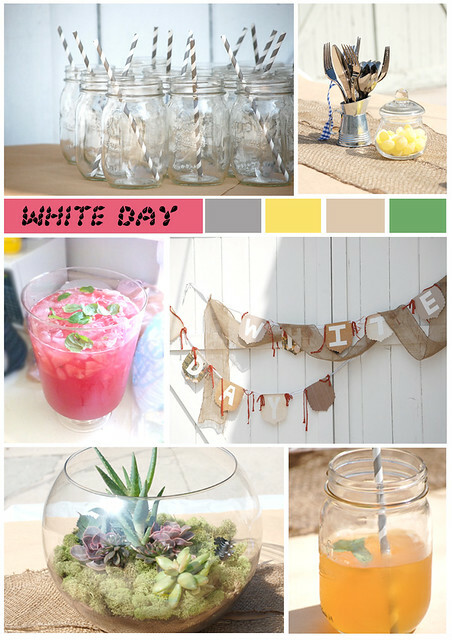 This included setting up tables and chairs in our backyard, hanging my burlap garland, making a succulent terrarium centerpiece and ensuring that our white-colored heart balloons remained unfettered by our cream-colored awnings. While inside, Morgan was in the kitchen whipping up a double batch of spiked sweet tea. Other notable dishes at the party included savory rosemary rice crispy treats, watermelon agua fresca, veggie enchiladas, cinnamon whiskey bread pudding and lemon pepper chocolate s'mores.